In a new best-selling book connecting Islam and Obama-style socialism, a former top terrorism prosecutor chides the national media for failing to investigate Barack Obama's "borderline criminal" activities in Kenya as a U.S. senator. Andrew C. McCarthy, the former U.S. attorney who investigated the American embassy bombing in Nairobi, Kenya, charges that Obama interfered in Kenya's internal politics possibly in violation of the Logan Act. The centuries-old law bars Americans who are "without authority of the United States" from conducting relations "with any foreign government ... in relation to any disputes or controversies with the United States, or to defeat the measures of the United States." Obama spent six days barnstorming the Kenyan countryside in support of Raila Odinga, the socialist Luo who was seeking the presidency. 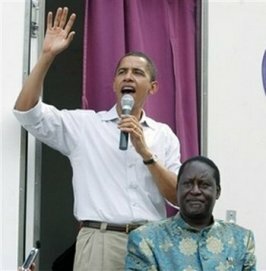 Appearing with Odinga at campaign stops, Obama gave speeches accusing the sitting Kenyan president of being corrupt and oppressive, leaving the masses in poverty. Obama's interference "was more than reckless," McCarthy writes. "It was borderline criminal (and that's being generous)." Earlier, Odinga had visited Obama in the U.S. – in 2004, 2005 and 2006 – and Obama had sent an adviser, Mark Lippert, to Kenya in early 2006 to plan a trip by the senator timed to coincide with Odinga's campaign. "Unborn babies should have the right to keep and bear arms - and legs and ears and eyes etc.!" and "Unborn babies should have the same right to be born alive that abortionists had!" For more insights, Google "Obama Supports Public Depravity" and "Mayor 'Napoleon' Bloomberg." Obama campaigned for his cousin Odinga, who after loosing, encited riots so he was then given the job of PM.. he then made a deal to write SHARIA LAW into this constitution.. Obama is pushing a SHARIA LAW constitution on the people of Kenya who do not want it!!! Obama soon will push sharia on us as well, since that is his entire goal, to acheive the global islamic caliphate.. Obama is the enemy of all men,,,he is EVIL!